Give your dog a good ol’ fashioned feast with the Blue Buffalo Braised Beef Dinner with Green Beans, Carrots & Wild Rice Dog Food Trays. Featuring tender chunks of beef with generous pieces of green beans, carrots and wild rice, it’s full of honest ingredients that you can see and dogs will love. The entire recipe is packed with wholesome, balanced nutrition— and equally important is what’s not in there. Leaving out all the stuff that isn’t good or nutritious, it’s food you can feel proud of serving, just the way nature intended it. Tender chunks of beef with pieces of green beans, carrots and wild rice in easy-to-serve trays. Real, deboned beef is the first ingredient with added vitamins and minerals. Inspired by a naturally wild diet, this protein-rich recipe caters to your dog’s inner carnivore. Completely free of corn, wheat or soy or artificial preservatives, colors or flavors. 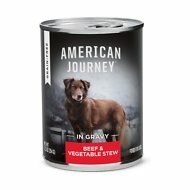 Beef, Beef Broth, Water, Chicken Liver, Dried Egg, Potato Starch, Green Beans, Carrots, Wild Rice, Guar Gum, Salt, Sodium Phosphate, Caramel Color, Natural Flavor, Calcium Carbonate, Potassium Chloride, Zinc Amino Acid Chelate, Iron Amino Acid Chelate, Choline Chloride, Xanthan Gum, Vitamin E Supplement, Copper Amino Acid Chelate, Manganese Amino Acid Chelate, Sodium Selenite, Thiamine Mononitrate (Vitamin B1), Cobalt Amino Acid Chelate, Niacin Supplement (Vitamin B3), Calcium Pantothenate (Vitamin B5), Vitamin A Supplement, Riboflavin Supplement (Vitamin B2), Biotin (Vitamin B7), Vitamin B12 Supplement, Potassium Iodide, Pyridoxine Hydrochloride (Vitamin B6), Vitamin D3 Supplement, Folic Acid (Vitamin B9). Feed 1 - 2 containers for every 10 lbs of body weight per day. BLUE has a diverse selection of delectable canned canine foods and single-serve cups, all featuring real meat and the finest natural ingredients enhanced with vitamins and minerals. With flavors and recipes inspired by wholesome, homestyle cooking, you'll find a large variety of wonderful wet foods all formulated to support your dog's health and well-being through every life stage, no matter his breed size. From summertime stews to turducken holiday feasts, our BLUE canned choices give your dog an amazing variety of healthy, delicious offerings including homestyle recipes specially formulated for puppies and senior dogs, plus healthy formulas for toy, small and large breeds. You can even start your dog's day off right with our tasty, single-serve breakfast entreés. This is an important difference between Blue Buffalo's canned dog food and many other wet dog foods that use wheat as a thickening agent. My dog loves his meat. He really loves this dinner for his dinner. It smelled good cause some dog food smells gross. Eh, definitely not a favorite for my pup! She likes it to an extent but I find she will still let her food sit. The first two days she gobbled it up then it was just whatever, THEN she just got to a point where she barely really ate until she got really hungry. But she is a REALLY picky eater overall so I wouldn't knock it until you try it! I have bought this everywhere... my doggie LOVES it mixed in with her hard food. the only difference with this one is is that there is WAY more meat in it when I buy it from Chewy vs when I buy it from other places. It's actually kind of weird. anyway definitely buy this for your pooch its the best! This food smells awful. My dogs turned up their noses. Finally after leaving it out for them all day, they nibbled on it. This is the first wet food I've tried that actually smells like real food. Our dog loves this mixed with her dry food!